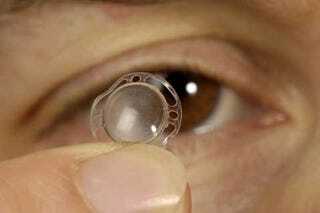 Researchers at the Fraunhofer Institute in Germany (the same people that invented MP3s) have developed an artificial cornea that can attach solidly to a patients natural cornea. It looks to be hugely promising for folks with damaged corneas, and having been successfully tested on adorable bunny rabbits, human trials are set to begin as soon as next year. I don't really get how they work, but I'm no doctor. Take a stab at the medspeak for yourself after the jump. "Our artificial corneas are based on a commercially available polymer which absorbs no water and allows no cells to grow on it," says IAP project manager Dr. Joachim Storsberg. "Once our partner Dr. Schmidt Intraokularlinsen GmbH has suitably shaped the polymers, we selectively coat the implants: We lay masks on them and apply a special protein to the edge of the cornea, which the cells of the natural cornea can latch onto. In this way, the cornea implant can firmly connect with the natural part of the cornea, while the center remains free of cells and therefore clear." What is special about this protein is that it can survive the later thermal sterilization of the artificial cornea without being damaged, as it does not have the three-dimensional structure typical of large proteins. Such a structure would be destroyed during the sterilization process, leading to changes in the material's properties. The optical front part of the implant is coated with a hydrophilic polymer, so that it is constantly moistened with tear fluid.